Architecture firm Gensler has won the commission to design the interior of the Chase Center, which will be located in the firm's native city of San Francisco. The arena, which will be constructed in the Mission Bay area, will host the home matches of the Golden State Warriors in time for the 2019-20 NBA season. Collaborating with Kansas City-based firm MANICA Architecture, who produced proposals for the arena's exterior, Gensler will fit out the 18,000-capacity stadium's concourses, clubs, suites, administrative offices, home and visiting locker rooms, as well as other visitor facilities such as concession areas, sponsor zones, a team store, and retail spaces. The Chase Center aims to create a new 11-acre district that will offer other amenities including restaurants, cafes, offices, and public plazas that aren't otherwise easy to find in the area. A new five-and-a half-acre public waterfront park will be built nearby; the Chase Center itself will have connections to a major Muni Metro rail line and the BART system. Once built, the arena is set to be the "only privately-financed facility of its kind built on private property in the modern era." "Gensler is a perfect fit for Chase Center, bringing both incredible local experience and extensive global expertise to our project—and, of course, a track record of architectural excellence," said Stephen Collins, Chief Operating Officer of Chase Center in a press release. "We want an arena that is a reflection of the Bay Area, but also a stand-out in the world of sports and entertainment. Gensler will help us achieve that mission." 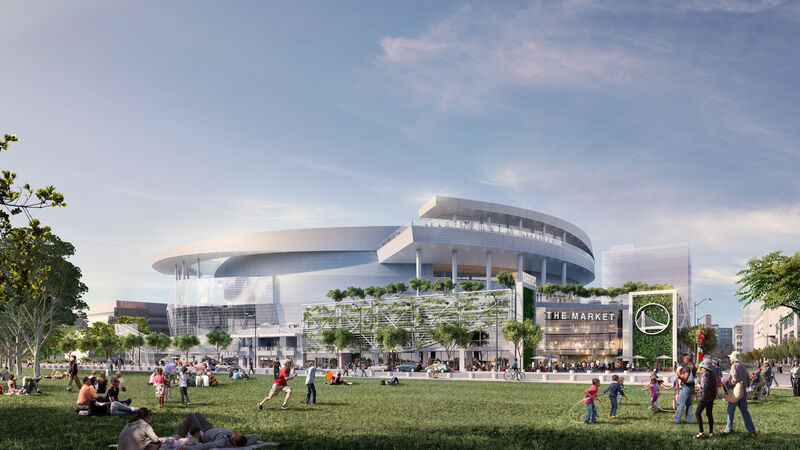 "Gensler is excited to join the current design team on such a significant project as Chase Center," said Gensler Sports Principal-in-Charge, Ron Turner, FAIA. "When complete, this will be a showpiece for the NBA, the Warriors, and the Bay Area, so helping to achieve this will be a distinct pleasure for our group." 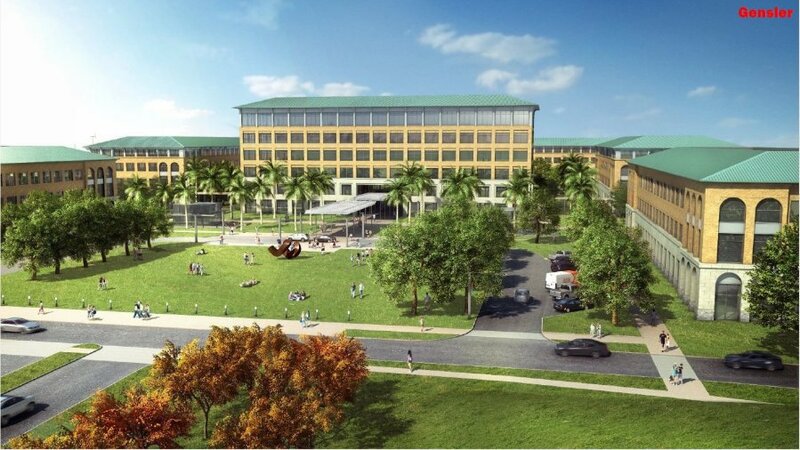 San Francisco firm Gensler's proposal for the new 96 acre Del Mar College campus in Corpus Christi, Texas has been given the official go-ahead. The campus will be located in the city’s Southside on the corner of Yorktown Boulevard and Rodd Field Road. Last year the college saw more than 24,000 students take part in credit and continuing education courses. "What we have is an opportunity to enlarge theses programs,” Del Mar’s vice president of Workforce Development and Strategic Initiatives Lenora Keas said. She also reiterated the necessity for the college’s expansion, saying that the courses offered are almost at capacity. Enrollment numbers for workforce and continuing education courses have witnessed growth of 76 percent over the last five years. "The demand is there like never before," said Escamilla. Continuing education courses would be offered at the new campus—which would serve up to 20,000 students—as well as engineering, computer science, hospitality and architecture, among others. Our architectural community became a little smaller this week. 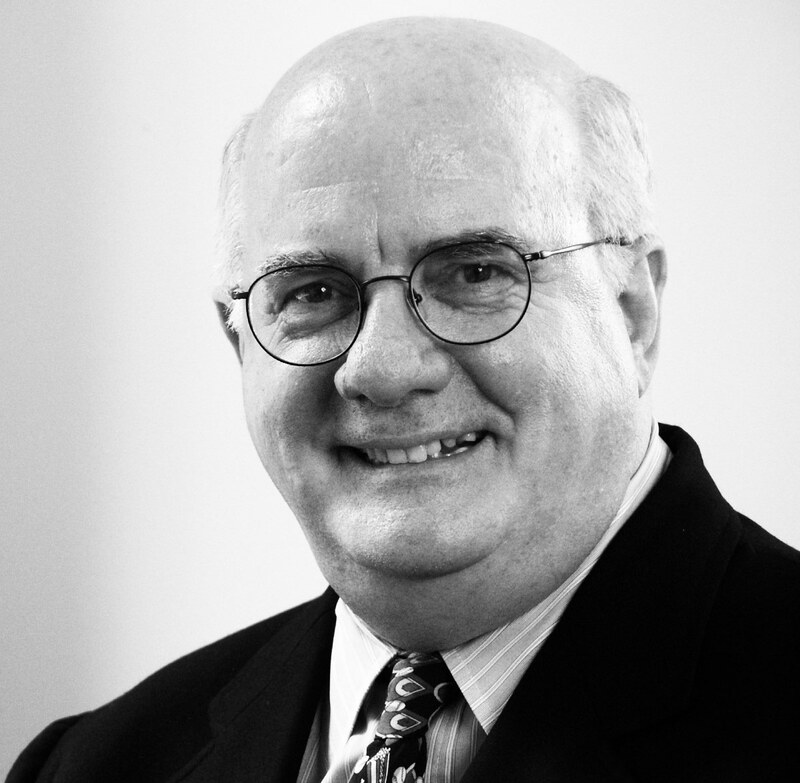 Sadly one of our members, Walter Alexander Hunt, Jr. FAIA died on May 27th 2016. He had a long and prolific career and intersected with many of us in different ways and at different points in our lives. To Gensler he was the consummate team player who joined the firm in its early days in San Francisco and became instrumental in transforming it from a small interiors practice into one of the leading and largest architectural firms in the world. During the course of his 38-year career, he hopscotched around the country setting up offices first in Denver in 1978 and then in New York in 1985 with Margot Grant. By the time he retired in 2012, he was the Managing Director of the Northeast Region and Vice-Chair of the firm. By all accounts he was incredibly successful. He was exceptionally skilled at giving life to large complicated projects. 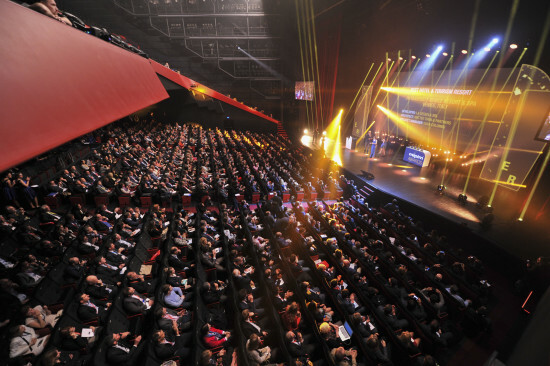 In 2009, for instance, he led the team of 9 architectural firms that completed the 16 million square foot MGM Mirage City Center in Las Vegas, still the largest private development in the US and the largest LEED development in the world. His most recent project was probably the Msheireb Downtown Doha, a 76.6 acre development in an historic neighborhood that incorporated traditional design features with smart grid technology and is on track to be the largest LEED certified community when completed. Any architectural office needs a dedicated staff of talented and motivated people to do the work and make it cohesive. Walter played a strong role in forging the entrepreneurial culture that became Gensler’s hallmark. After a couple of years at Gensler he decided to pursue a passion for industrial design and quit his job. He stayed in touch, decided the small firm he was at wasn’t for him, and was invited back. He felt that the experience caused him to grow and develop as an architect and made him so much more committed and more valuable to Gensler. Business journals have written a lot about the ‘boomerang’ as a way of motivating employees; Gensler institutionalized and celebrated the practice. Others often cite Gensler as a model and quote Walter. To the AIA he was a former Chapter President, Center for Architecture Foundation President, and member of the NY State AIA Board. Without Walter, there would probably be no Center for Architecture. When the local chapter occupied a couple of donated desks in a borrowed office on the 6th floor the Interior Design Building in the late 90’s, Walter helped conceive of a storefront to promote design and architecture in New York and served as co-chair of the Capital Campaign. They raised $6 million ensuring that the Center would become a leading and permanent cultural institution in New York. Inspired by the vibrancy in New York, more than 20 architecture centers sprouted around the country. Walter was highly committed to the next generation and educating both the practitioners and the public about design. He mentored young (and middle-aged) architects and funded more than a few organizations he felt would make a difference such as the ONE@@Time Foundation which provides pro bono design services to non profits. He also established multiple scholarships for architecture students both through the AIA and Yale, his alma mater. Yale tapped him for the Alumni Committee and the Dean’s Council. He even served on the Advisory Board of cultureNOW and helped shape its programming, its internships, and its mission to make the built environment accessible. Everyone who had the opportunity to collaborate with him would talk about his commitment, generosity, support, leadership, mentoring, and enthusiasm. Not only did he give advice, but he participated in the programs. He received many awards including the AIANY Chapter’s President’s Award and the Harry B. Rutkins Award, as well as the AIA NY State’s James William Kideney Gold Medal. Gensler established its ‘One Firm Firm’ Award in his honor. This is quite a testament to an extraordinary career. Our hearts go out to his wife Judy, his companion through life, and his family who will miss him more than we will. Gensler’s Los Angeles office has revealed plans for a $150 million expansion to the Port of Los Angeles by marine science and business innovation group AltaSea. 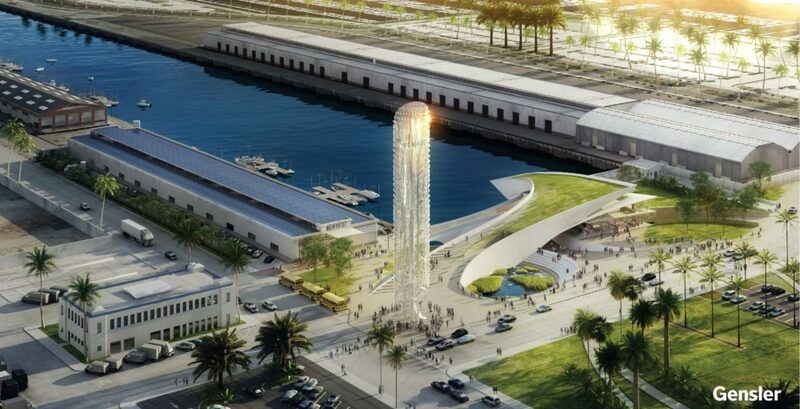 At a ceremony hosted at the firm's Downtown L.A. headquarters, designers at Gensler detailed a 280,000 square foot facility encompassing a new waterfront promenade, aquaculture research center, and science hub set 35-acre stretch of historical docks and waterfront spaces. The project combines the adaptive reuse of existing dockside warehouses with the construction of a new visitor’s center and signal-house. Three formerly industrial warehouse shells, exposed composite steel beams, and original overhead trusses will house dedicated research and business development facilities for aquaculture and underwater robotics endeavors. The project's development will be divided into phases beginning with the redevelopment of Warehouses 58 through 60, which will add 180,000 square feet of combined research and business hubs to the site. This phase also incorporates an education pavilion and wharf plaza into the mix. The second and third phases entail renovating Warehouse 57—which will contain 60,000 square feet of laboratory and classroom space—and the construction of the site's two new structures. Those new constructions, Berth 56 and a tower dubbed “the Viewing Structure,” are located between the arms of the two docks housing the science warehouse spaces. Berth 56 is a landscape-oriented community center with educational and exhibition spaces, as well as amenities like viewing platforms and a theater. The 5-story viewing tower is located at the foot of a Berth 56’s roof terrace, which has been sculpted to blend with a street-level plaza. After citing the prominence of tower structures in the port’s historical development, Li Wen, Design Director at Gensler, described the firm’s approach with the new tower as an attempt to, “make a place with a new, 21st century tower that’s all about sustainability. So instead of emitting light, this tower actually harvests energy.” The overall scheme is an attempt to create a closed loop of scientific discovery, product innovation, and entrepreneurial commercialization at AltaSea’s campus. It is also being designed to be “net-positive” by generating more energy, through tidal, wind, and solar generation, than it consumes. Gensler expects to begin construction on the first phase of the project in 2016 with the community center set to open in 2023. 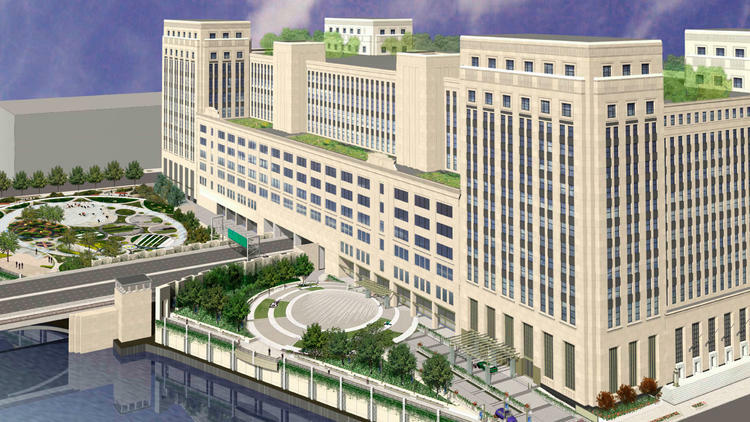 Chicago’s historic Old Main Post Office may finally be redeveloped. The city has announced that the gigantic empty structure has been sold to the New York-based developer 601W Companies LLC for an undisclosed amount. The Graham, Anderson, Probst & White-designed building was once the largest post office in the world, handling the seemingly endless mail order traffic coming from Chicago retailers such as Marshall Field’s, Montgomery Ward, and Sears. With the decline of those companies and the rise of private shipping companies, among other causes, the post office was completely shut down, with operations moving to another site in 1995. Built between 1921 and 1932, the building has 2,500,000 square foot of floor space, and 18-foot ceilings though out many of its spaces. Since its closure it has often been used as a film set, including in the recent Batman and Transformers movies. In the years since the city sold the building to private investors, it has changed hands multiple times. With each sale promises of redevelopment ranging from adding high-rises to the top, to cutting an atrium through the building’s heart, have all come to nothing. In February, the city announced that it would take the building back through eminent domain and put out its own RFP for a developer. With the involvement of 601W the city has suspended that plan, at least until June, to give 601W a chance to finish acquiring the building and pursue its redevelopment plan. Working with Chicago-based architects Gensler, 601W’s $500 million redevelopment plan includes a three-phase renovation that would turn the building into office space. Other amenities will include a three acre rooftop park complex, outdoor cafes, events space, a fitness center, and a public river walk. The first 24 months of construction are planned to bring the building up to code, replace the roof and windows, and restore the facade. The second phase will update the building’s systems, while the third phase will restore the historic lobby and finish tenant spaces. 601W is also the owner of Chicago’s AON Center, Prudential Plaza and the former Montgomery Ward warehouse. Gensler was not immediately available for comment on the project. 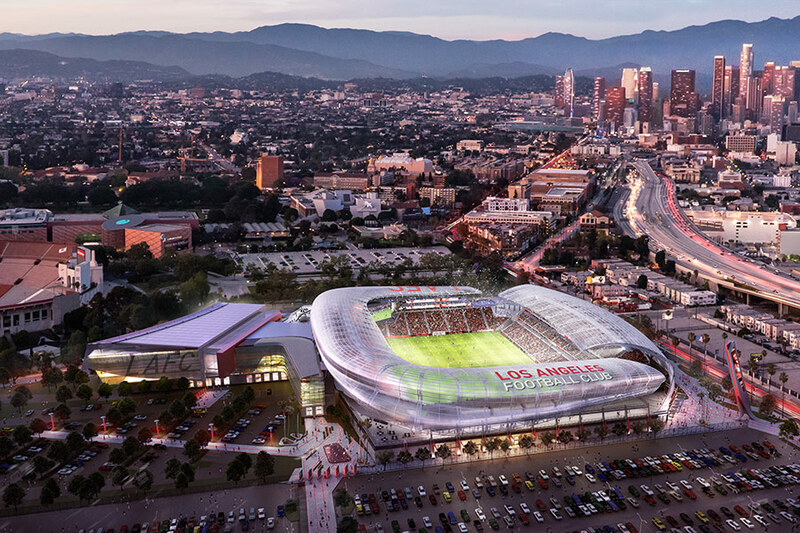 Gensler’s proposal the Los Angeles Football Club’s (LAFC) $250 million stadium complex in South L.A. moved one step closer to becoming a reality this week when the L.A. City Council “unanimously approved” the final Environmental Impact Report for the 22,000 seat stadium project. The sports arena is expected to be the most expensive privately-financed soccer stadium in the country. Like many new urban stadium proposals, LAFC’s stadium is also set to feature sidewalk-adjacent restaurants, office space, a conference area, as well as a soccer museum alongside its more traditional sports programming. The new stadium for the as-yet-unnamed franchise will replace the outmoded and unloved L.A. Sports Arena, a 1959 Welton Becket-designed, elliptical transverse steel truss roof-clad spaceship of a building. That structure has been the home for the Los Angeles Lakers and Los Angeles Clippers professional basketball teams as well as University of Southern California’s and University of California, Los Angeles’s college basketball teams in the past. It has also hosted concerts by Pink Floyd, Madonna, Michael Jackson, and the Grateful Dead. The L.A. Sports Arena held its final event in March when Bruce Springsteen performed there to a sold-out concert. Demolition of the L.A. Sports Arena is set to begin in June of this year. The new stadium is expected to open in 2018. After moving this past July, the A+D Museum in Los Angeles is now fully settled in its new home at 900 East 4th Street in the developing Downtown Arts District. The exhibit that opened March 24 features the work of creatives like product designers KILLSPENCER x Snarkitecture, to architects/gamers Ozel Office, to sculptor Vincent Tomcyk. A+D was founded in 2001 by architects Stephen Kanner and Bernard Zimmerman and focuses on contemporary architecture and design exhibits, educational programming, kid-focused design workshops, and outreach. The museum originally opened in the Bradbury Building and was nomadic for much of its first decade. In 2010, the museum thought it found a permanent space at 5900 Wilshire Boulevard on Museum Row near the Los Angeles County Museum of Art (shout out to one former exhibit Never Built: Los Angeles co-curated by AN contributing editor Sam Lubell). But eminent domain forced A+D to look for another spot. Soon after moving in, the Metropolitan Transportation Authority announced plans to demolish the Museum Row building to make space for the future Fairfax station that is part of the in progress 3-phase Purple Line extension. The complete extension is estimated to open, if on schedule, by 2035. Gensler designed A+D’s new digs, renovating an 8,000-square-foot old brick building that could have been a bowling alley. The new arts district location means the museum is across from the downtown L.A. architecture school, SCI-Arc. These recent developments are part of a larger effort to convert an area that was once mostly empty warehouse into a new neighborhood celebrating art and design. As an architectural typology, the contemporary office building sits at the intersection of a number of social, economic, and environmental trends: the changing nature of the workplace; the expanding reach of communications and other technologies; and an increasing focus on sustainability and resilience. Three AEC industry professionals at the forefront of office building design and construction will be on hand at this week's Facades+AM DC symposium to discuss the new materials and technologies (including coatings, fritting, curved, and formed glass) that can be brought to bear on the challenges and opportunities associated with private- and public-sector office projects. Bob Schofield, Senior Vice President of Development and Director of Design and Construction at Akridge; Front Inc. Founding Partner Marc Simmons; and Gensler's Firmwide Commercial Office Building Developers Practice Area Leader, Duncan Lyons together bring years of experience in high performance design and construction to the conversation. Asked about the factors influencing the design of an office building's facade, Gensler's Lyons cited, "How the office building contributes to place-making, energy performance, and user experience; creating a healthy and inspiring workplace; [and] connecting building users to daylight, outside air, and a unique sense of place." 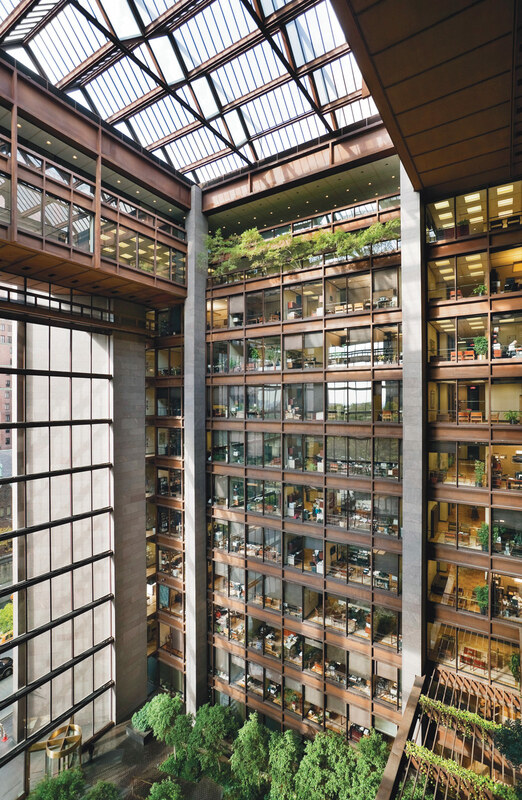 That the worker experience is a key consideration in office building design reflects a broader transformation in American work culture, one in which a focus on fostering employee potential has replaced the traditional emphasis on products and processes. Just as employer–employee relationships have changed, so, too, has the technology available to tackle other pressing issues, including environmental performance. Lyons sees a future for dynamic building facades that utilizes new glass technologies, operable facades, and user adaptation—developments that promise to boost both worker satisfaction and sustainability. Hear more from Lyons, Schofield, and Simmons, as well as other movers and shakers in the facades world at Facades+AM DC. Register today and earn CEU credits at the event March 10. In Downtown Los Angeles, a glass slide is being attached to California's tallest building, almost 1,000 feet above the ground. Dubbed Skyslide, the slide will descend from the 70th to the 69th floor of the 1,017-foot-tall US Bank Tower. The building was designed by Pei Cobb Freed & Partners and completed in 1989. According to the Council on Tall Buildings and Urban Habitat, it was the first supertall on the West Coast. 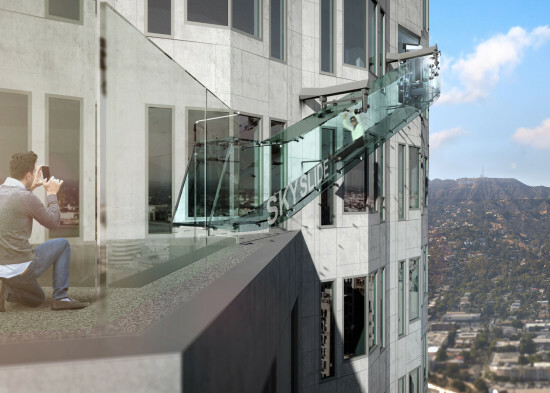 Constructed from 1.25-inch-thick glass panels, the Skyslide will be approximately 46 feet long and 4 feet wide and adhere to the building's exterior via a metal support system. Singapore-based developer OUE Limited is initiating the project as part of Skyspace L.A., an approximately 850-square-foot observation and exhibition space on top of the tower. 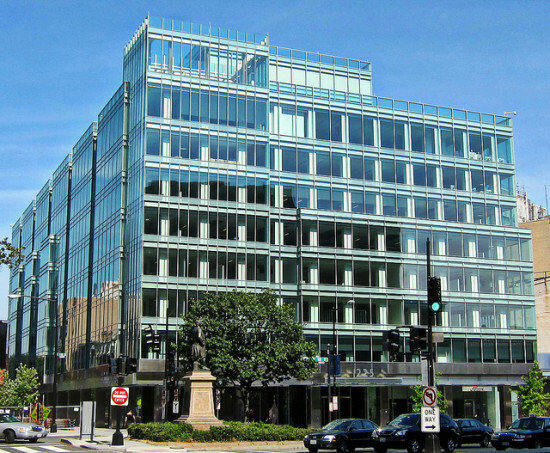 The project is part of a $50 million building-wide renovation plan and upgrade led by Gensler. Skyspace L.A. is primarily geared towards tourists, though no doubt locals will appreciate panoramic views of the city, San Gabriel Mountains, and the Pacific Ocean. It will cost $25 to visit Skyspace and a ride on the Skyslide will cost an additional $8 when the site opens on June 25th. Although this slide may be the most vertigo-inducing, it's not the first large-scale slide to be installed on a tall structure. The 376-foot-tall ArcelorMittal Orbit Tower in London's Olympic Park, designed by Anish Kapoor, features the world's longest and fastest tunnel slide. Riders descend for 40 seconds at 15 miles per hour, getting fantastic views of East London along the way. Golden Globe–winning actress Gwyneth Paltrow has unveiled plans for a private club in West Hollywood with a design by California-based Gensler. "The Arts Club," as it will be known, is touted to cost $3,000 a year, and will occupy a 132,000-square-foot plot. The club includes a wellness center, night club, selection of restaurants, creative office space, gallery, cinema, and 15 guest rooms. A multi-story underground parking garage will also be located on Hilldale Avenue. The club hopes to emulate the successes of the SohoHouse private club that originated in London in 1995. SohoHouse has since expanded to New York, Chicago, and West Hollywood. According to Curbed LA, the club will take the place of the former Hustler building on the Sunset Strip. That structure, owned by Larry Flynt, had occupied the space for 18 years. The adult magazine will move its offices to Hollywood Boulevard. In a marked transition, Paltrow has reportedly deemed the club a no swearing zone. As for Gensler's design, the nine-story building uses a vertical aluminum fin system that pivots upon axial fittings attached to the building's facade. 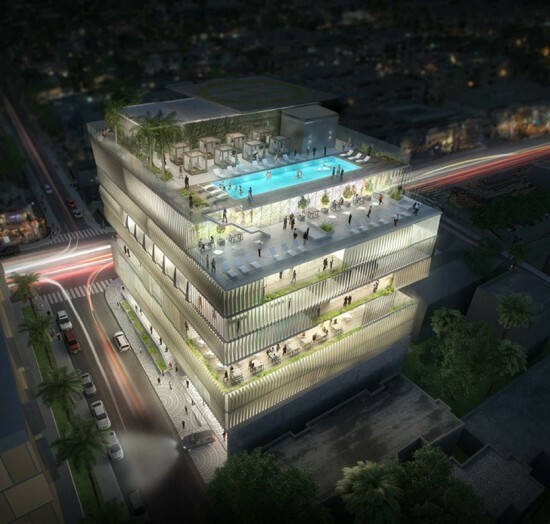 Besides the aforementioned amenities, the rooftop terrace will be the building's main attraction, offering a luxury pool with a view over L.A.
Paltrow's dream isn't quite ready for construction yet, however, as the proposal still awaits permission for various aspects of design, notably the structure's height.